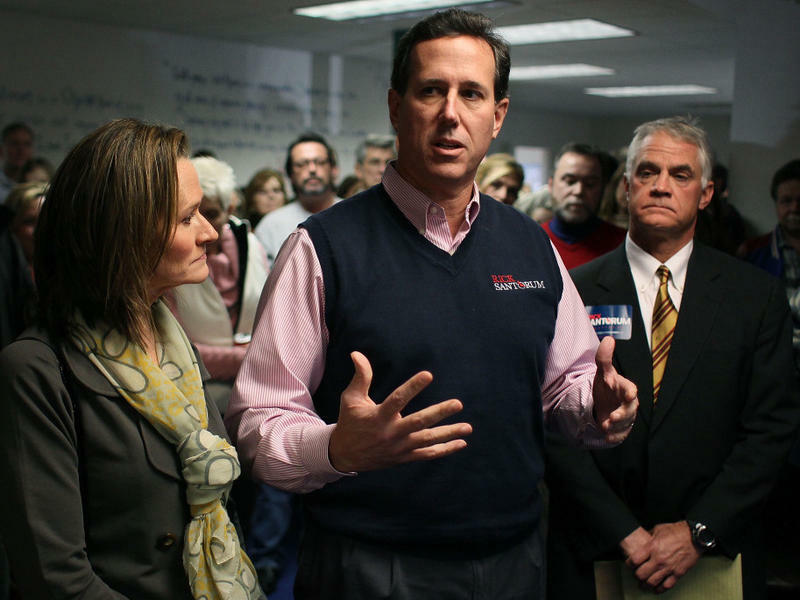 GOP Presidential Contest: Is It Over Or Just Getting Started? 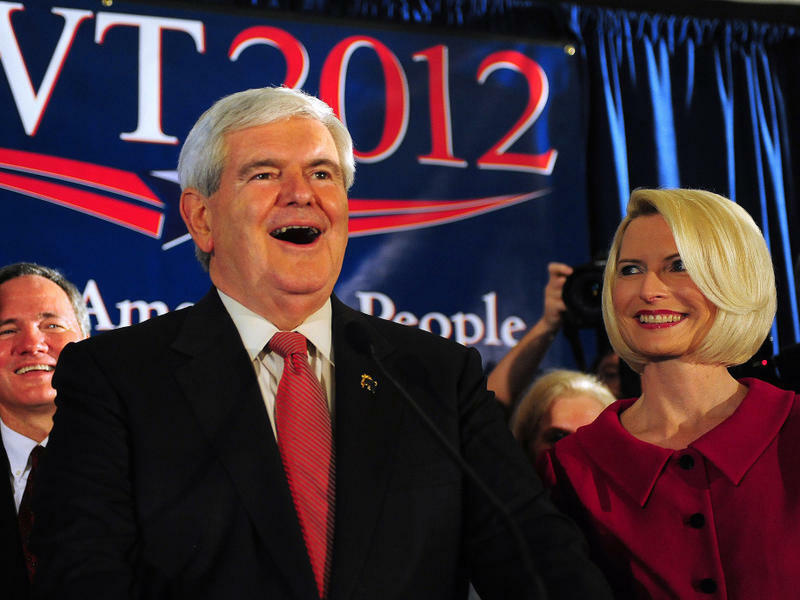 Over the weekend, we heard Newt Gingrich assuring Floridians that his campaign was going all the way to the GOP's August convention. Once the delegates got to Tampa, he said, all those who opposed former Massachusetts Gov. Mitt Romney would unite to deny him the nomination. 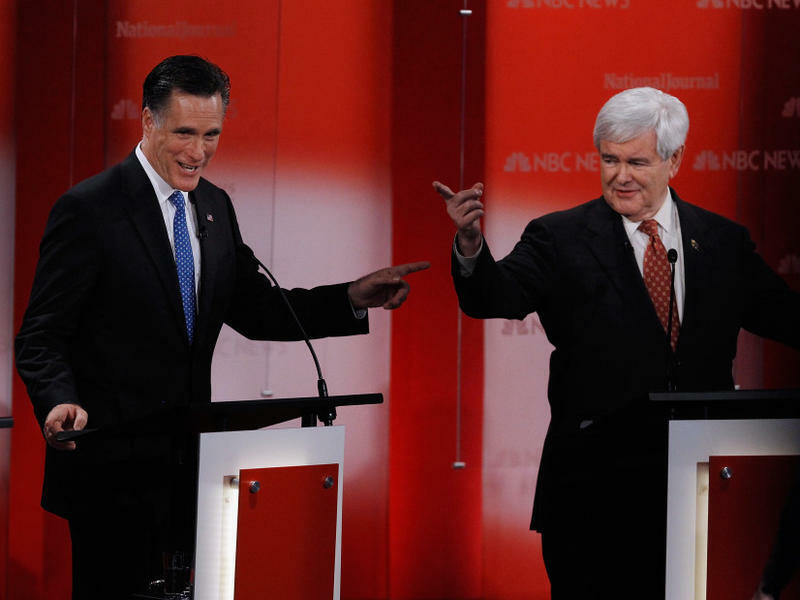 "My job is to convert that [anti-Romney majority] into a pro-Gingrich majority," the former House speaker said Sunday. We still don't know who'll win the Florida primary Tuesday, but after the past two debates it seems far likelier to be Mitt Romney. Why? 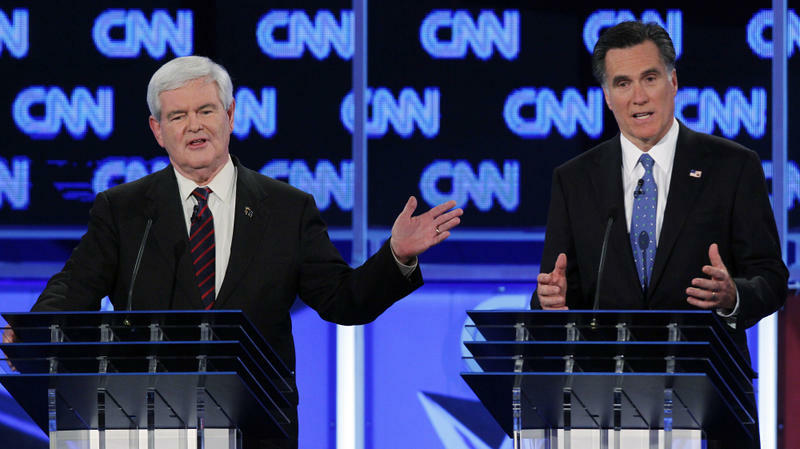 Because Newt Gingrich had vaulted from the margins to the forefront of the Republican presidential race in South Carolina on the strength of two debate performances. And that weapon has ceased to work in his favor. The NBC and CNN debates this week in Tampa and Jacksonville went a long way toward neutralizing the impression created by debates the previous week in Myrtle Beach and Charleston. 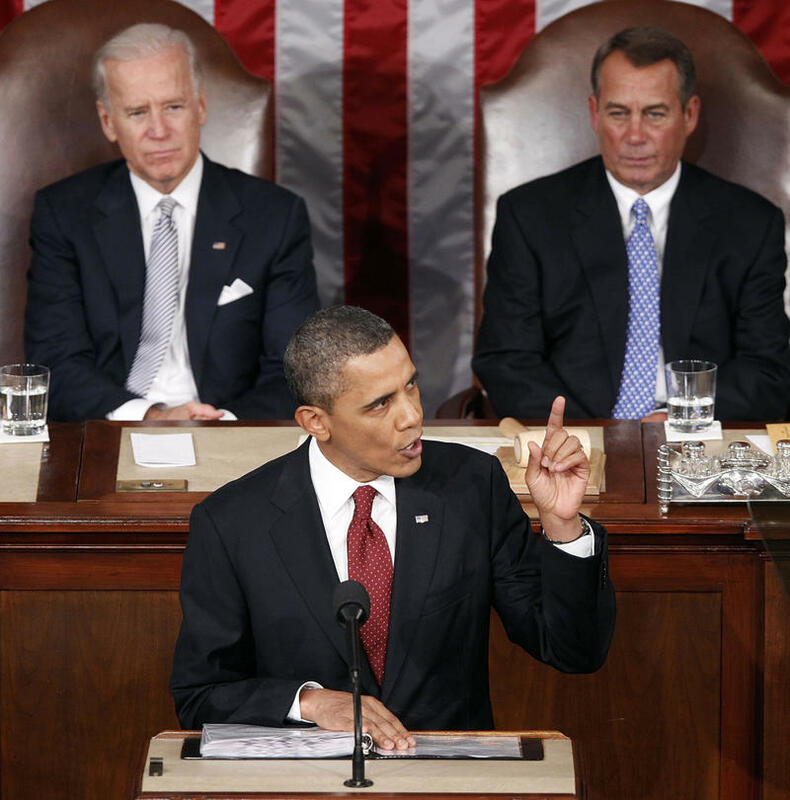 This year's State of the Union address may have set a record for fewest surprises. The usual elements were all in place, starting with the sergeant at arms shouting across the din of the chamber, quieting the crowd of worthies from both House and Senate, the Cabinet and the Supreme Court. Then the president made his way down the center aisle, shaking hands with the members who had sent staff members to reserve these favored seats for hours for just this moment. 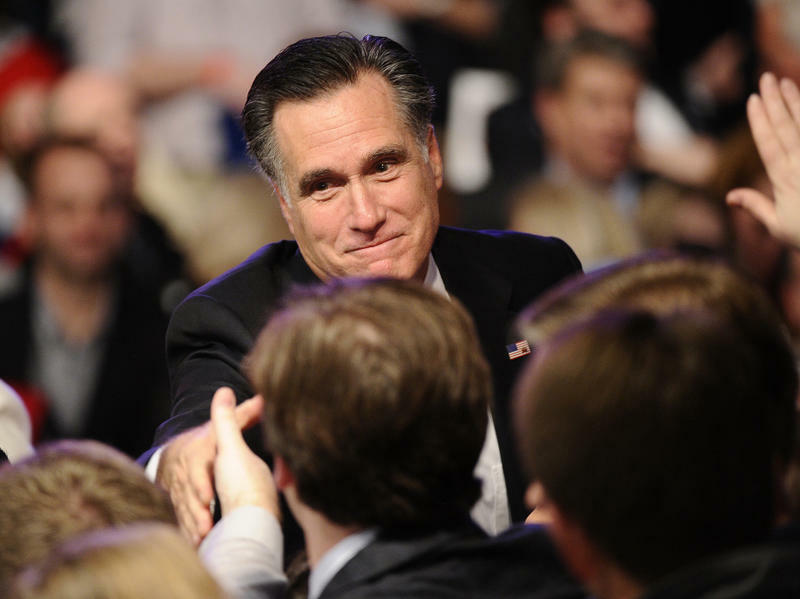 Romney Redux: Did The Front-Runner Find A Way Back In? On Tuesday, it is likely the presidential campaign's focus will shift to Mitt Romney's tax returns, which show him making $42.5 million in 2010 and 2011. That number may be bigger than he can finesse by saying in essence: Don't hate me because I'm successful. 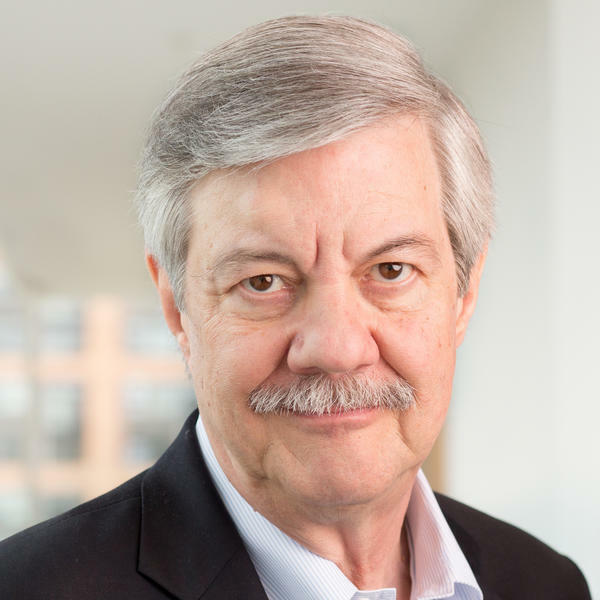 By embracing Newt Gingrich in its primary, the South Carolina GOP has risked its remarkable record of success at picking the party's eventual nominee for president. It's been quite a run. Beginning with its primary in 1980, when it chose Ronald Reagan, South Carolina has voted first among Southern states. And the Palmetto State's choice has gone on to dominate the other Southern states and lock up the nomination in short order. That happened eight times in a row, counting incumbent renominations. 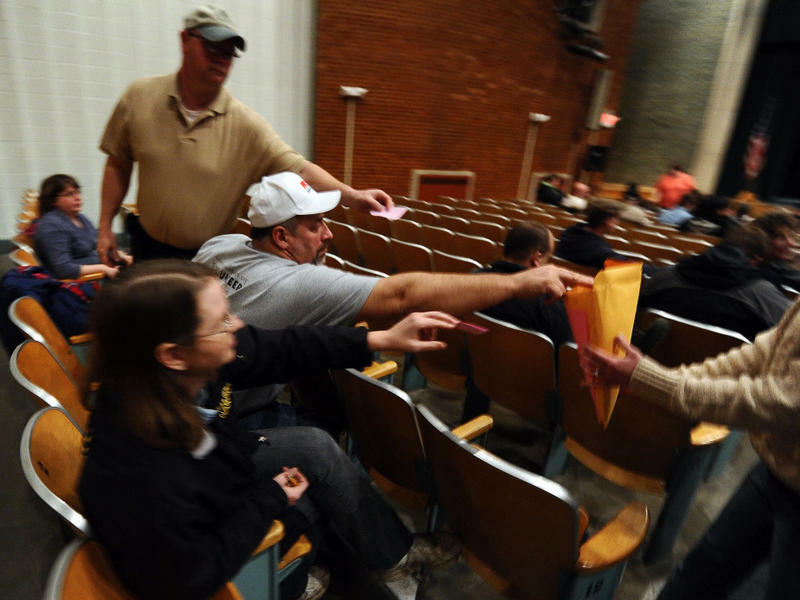 How embarrassing for Iowa GOP officials. How embarrassing for Iowa Republicans as a party. How embarrassing for Iowa. But on the other hand, who told the world to hold its breath earlier this month, awaiting the latest word on who had edged ahead in the Iowa caucuses? That would have been us. The news folks. Up all night to bring you the latest information — or misinformation, as it turns out. And who told the world to care about these homey little midwinter Midwestern klatches in the first place? That, too, would have been us. There could not have been more apt an epitaph. The once-promising campaign of former Utah Gov. Jon Huntsman came to an end within hours of his being endorsed by The Columbia State, South Carolina's largest and most influential newspaper, within days of that state's Republican primary. The woman who wrote the State's endorsing editorial said she felt as if she'd been wooed and won and abandoned by her newly betrothed. 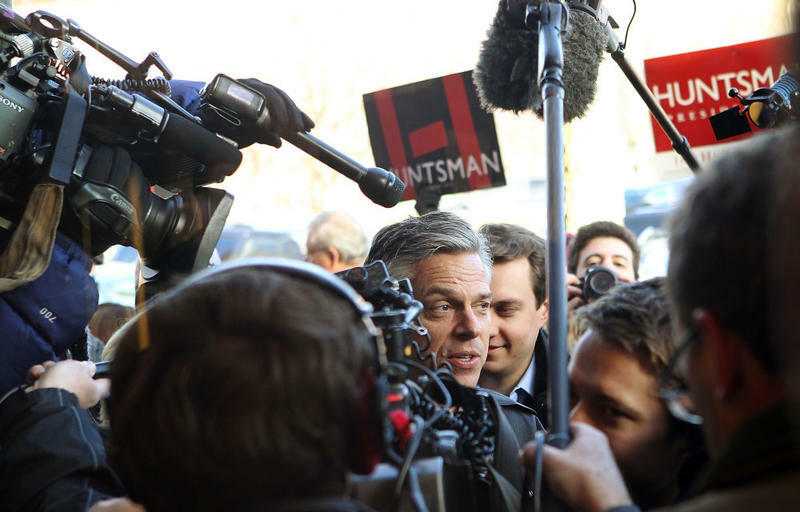 Indeed, over the course of his campaign, Huntsman left more than a few journalists feeling jilted. The gathering of more than 100 evangelical Christian leaders and activists in rural Texas this weekend was an 11th-hour effort to unite "movement conservatives" behind a rival to Mitt Romney and demonstrate their own power within the Republican Party. Instead, it may well be a revelation of their weakness as a force within the GOP. Because if Romney still wins the South Carolina primary next weekend, this final flailing attempt to stop him will make his victory all the more important — and his eventual nomination all the more inevitable. The satisfying victory Mitt Romney harvested in New Hampshire's primary this week was marred by the late eruption of a blemish. It could be a passing cloud in the otherwise blue Romney sky, or it could be the sign of storms ahead. Does anyone remember Willie Horton? Does anyone remember the tragic trajectory of another Massachusetts governor, Michael Dukakis, in 1988? As Mount Washington calmly reigns over much of New Hampshire's geography, Mount Romney smiles down on the last day before the state holds the nation's first presidential primary. The front-running former governor of neighboring Massachusetts spent the day getting chummy with crowds in Nashua and Hudson and Bedford, reciting his favorite lines from "America the Beautiful" and engaging in other behaviors just as risky. 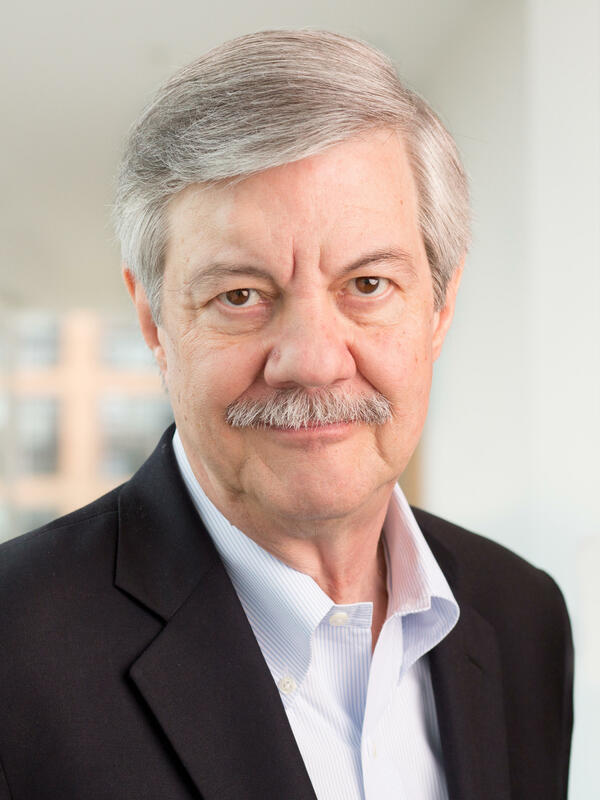 He came out in favor of free enterprise and job creation and got really cross with the Chinese for currency manipulation and intellectual property theft. At last, the rivals who were supposed to savage front-runner Mitt Romney in the final weekend before Tuesday's primary in New Hampshire got down to business. 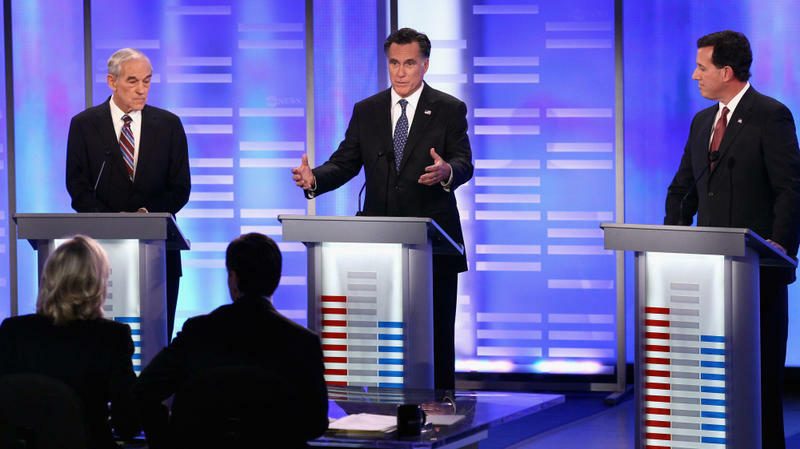 In the opening minutes of their debate Sunday on NBC's Meet the Press, several of those chasing Romney in the polls let fly the roundhouse punches they'd been pulling through weeks and months of TV debates. Once more, the great media consensus was confounded. 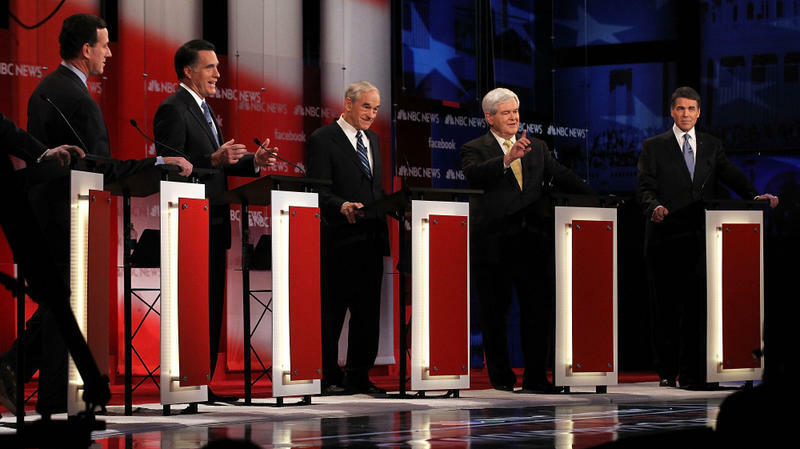 Saturday night's debate at St. Anselm's College in Manchester, N.H., produced another battle among half a dozen presidential contenders, much like a dozen before it. 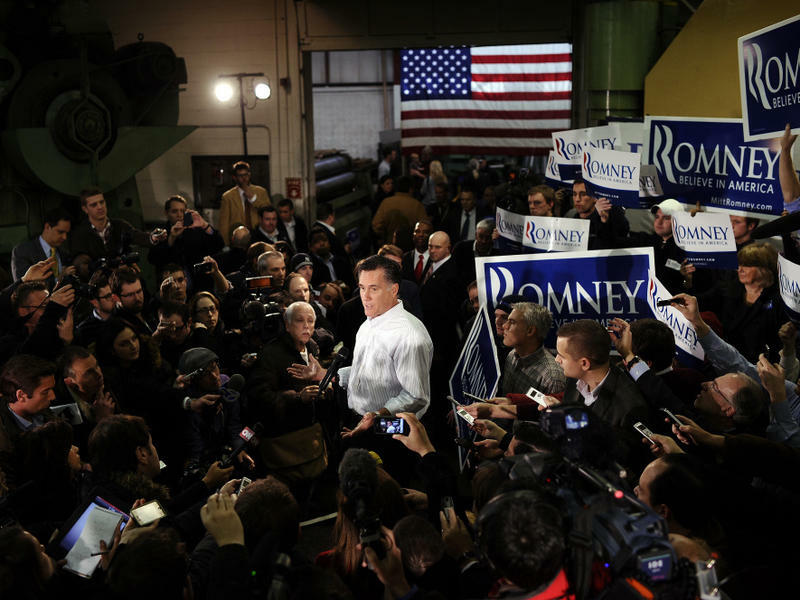 Front-runner Mitt Romney was neither knocked out nor even knocked down. He was scarcely even knocked around. Once again, the evening ended with the bruises pretty equally distributed among the contestants. And with the New Hampshire primary bearing down on Tuesday, virtually no time remains for Romney's rivals to bring him down.